With the colder months soon upon us, adding vibrancy and colour to your home with house plants is a great way to inject something new and creative into your décor. Both plants and flowers have made a big comeback in interiors in recent years, so don’t shy away from integrating them into your scheme. They can add movement and interest in a way no other accessories can, and really bring your home to life. If you want to embrace the trend, here are some of our top tips for making house plants work in your home in the autumn and winter. Find out everything you need to know about house plants in our guide. Why not check out our buyer's guide to the best indoor plants? Make the most of both colour and texture and use plants just like you would any other home accessory. Use the hues of the leaves to co-ordinate with your wall colour or other colour accents in a room. Think about interesting ways to display plants, hanging them from the ceiling in macramé holders, combining different sized terrariums or contrasting alternate heights with different coloured foliage and flowers. Be bold and display plants in larger groups for a real wow factor in any room. Group in odd numbers for a professionally styled look, choose a colour palette that complements your room scheme and don’t be afraid to experiment. Use a mix of materials for plant pots, which suit your home and your décor. Display them in a mix of metallic holders for an on-trend look, glass for something timeless, and geometric, angled pots for a contemporary look. Succulents, cacti and orchids are very stylish and great throughout the winter, so consider ways to integrate them into your home. Line these easy-to-care for plants on a windowsill for an instant update to any room. Minimal, unfussy plants like the orchid will give your home a contemporary feel and coordinate well with both modern and more classic styles. The beauty of the plant is that it won’t date or become out of vogue, simply learn how to tend and care for them to breathe new life into your interiors. Unusual materials mixed with plants and flowers can look stunning. Think about experimenting with fur, hessian and metal for creating plant pot décor that goes above and beyond the norm. Wire baskets and concrete planters add innovative texture to homes and are a great way to bring small amounts of these materials into your living space. The fresh, bright green of tropical plants can really bring out the colour scheme of a room – and not always in ways that you expect. White and green is a firm favourite, but why not try out a bolder contrast between a blue colour scheme and the green of plants? In this living room, the colour scheme is also accented with a Brass Hanging Planter from Audenza. 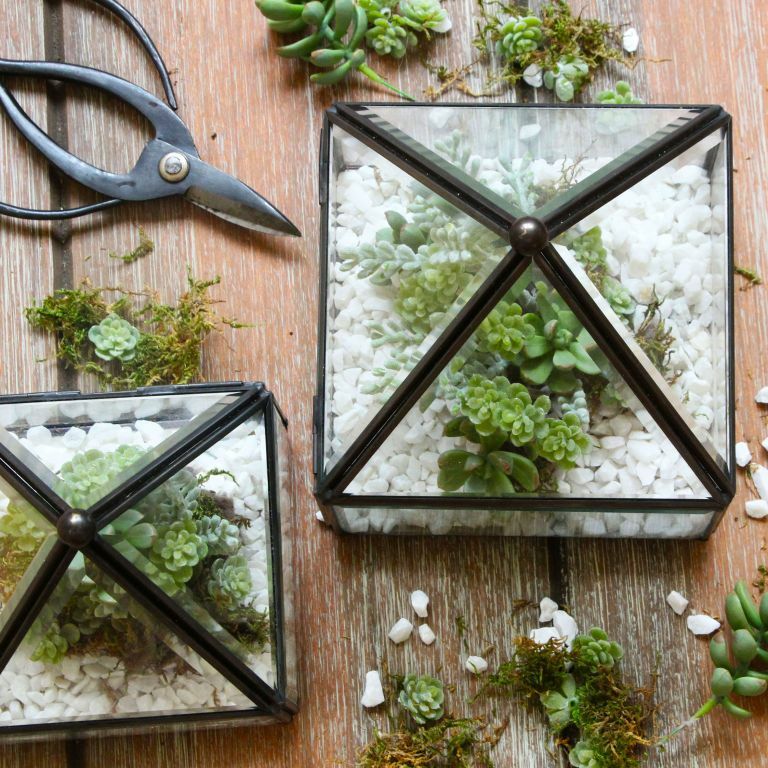 Terrariums are very easy to create yourself and the fun, geometric shaped planters can be found in places like Rockett St George, West Elm and Rose and Grey. Etsy and Not on the High Street also have a great selection, so there’s plenty of choice to suit everyone. Bathrooms can really be transformed with house plants (many of which will love the humid air of a bathroom). Experiment with ferns or trailing plants on a shelf or next to your basin for a sophisticated and exotic look.